As the solar industry continues to thrive, now more than ever are people eager to enter this market. Research, planning, and a strong business model can be the factor that makes or breaks your business. Below, are some factors to consider if you want to start a solar business that will help you succeed in the industry. While the solar industry continues to boost its numbers in growth, it like all industries eventually becomes crowded. This is why it is critical to differentiate your solar company from its competition and establish right away what makes you unique and give you value over the competition. By conducting market research, as well as searching some of the “needs” or “problems” of the solar industry, can equip your company with the knowledge you need to correctly position yourself. As the industry continues to grow and become more crowded, it absolutely necessary to find your company’s niche in order to survive. During the planning phase, you should formulate your business model. You don’t need to have graduated from a top business school to put one together. Most peoples plans change over time due to unexpected circumstances anyway however it’s still important to have a map with the general route you plan to take. While you should always believe in your vision, it is absolutely critical that your plan sticks to the numbers. To start a solar business, one that is successful lies in the foundation of its business plan. Establishing your target market, break-even point, COGS, margins, are but few of many critical components your model should clearly outline. Find an accountant. Almost all counties require you to file and pay taxes. Some countries have more complicated systems then others but if your good at your business you would probably rather be focusing on solar then on accounting. Let the experts do this for you, in the long run, it will ensure your growth and legal status is in check. Ultimately it is your responsibility to make sure your business completes all necessary paperwork to comply with federal and state authority. Accounting all necessary expenses, you should budget how much money left over you have to spend on developing your brand. Branding can significantly help your business if done correctly, and can really help develop an identity that customers can associate with your company. Although branding can be expensive, there are some ways to save in this department, such as hiring interns, utilizing free online design platforms, and devoting time to growing social media platforms along with other free online applications. Also, another way to cut expenses is to think of creative ways to reach your customers. By thinking out-of-the-box, your solar company does not have to be limited to relying on customers to find them online. Trade shows, attending home shows, and getting involved with the local community are a few of many ways that you can find and create meaningful, long-lasting customer relationships. Because at the end of the day, the relationships that your business creates with its customers is what dictates the longevity of your business. Let’s face it, to start a solar business, although can be lucrative, is time-consuming, complicated, and capital-intensive. 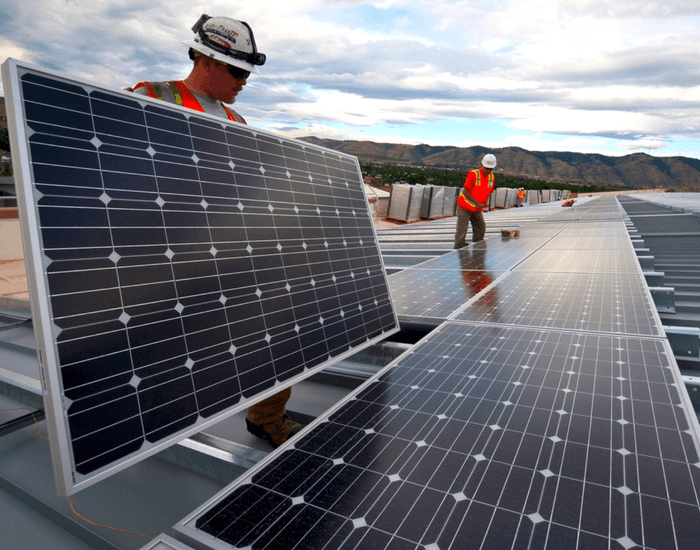 While it is possible to build a company from scratch, many solar businesses initially do not succeed due to inadequate planning, budgeting, or lack of knowledge in the industry. This is why utilizing a partnership can be the catalyst towards helping your solar company financially succeed. 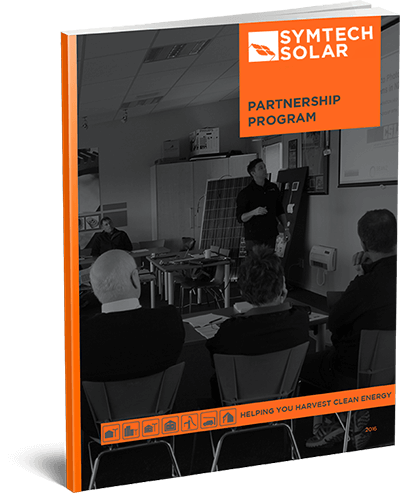 With many years of experience, your partner has the knowledge and capabilities in the solar industry that you most likely lack in the beginning stages of your business. At Symtech Solar, it is our mission to simplify your solar energy experience, with our cost-effective and ready-to-install PV technology kits. Which is why we created our partnership program, your one-stop shop for creating a thriving solar business. Along with the wide variety of benefits, discounts, and special offers we offer our partners, we are committed to streamlining your solar business. Along with this, your business will be able to utilize our PV Kit Design Tool, an industry-leading technological tool aimed to help our partners determine the most suitable solar solution based on current energy usage and location. Overall, at Symtech Solar we value creating long-lasting relationships with our partners. Since our partners represent who we are as a company, we seek quality candidates with enthusiasm and passion for solar technology. Since we are highly involved with our partners, we guarantee you and your company will get the proper training and guidance you need to ensure the highest standard of service quality is maintained. At Symtech Solar, we want to simplify your solar experience, from beginning to end. Which is why we made our partnership process as easy as 1-2-3. Take the hassle and complication out of starting a solar business by letting us do the heavy lifting, so you can focus on what’s important, such as running your growing company. When you decided that its time to make your mark in the solar industry, sign up for our partnership program online.